So, Project64 2.2.0.1 is not detecting my controller. I wanted to take a previous version of PJ64 that I have (1.6), save the config, and load that config for PJ64 2.2.0.1. It didn't work, because 1.6 saved it as a .JSF file, while 2.2.0.1 loads it as a .CPF file. I am using a PS3 controller (with SCPToolkit, making it seem like an Xbox 360 controller), and my OS is Windows 7 64-bit. Help? I can't see that image, but if you could make one of your settings that would be helpful. but if you could make one of your settings that would be helpful. Say what? Excuse me? Speak again? think he tried to link this? Yes, that's what I tried to link. Doesn't allow me to add controller inputs. Help? Is there supposed to be something above that? 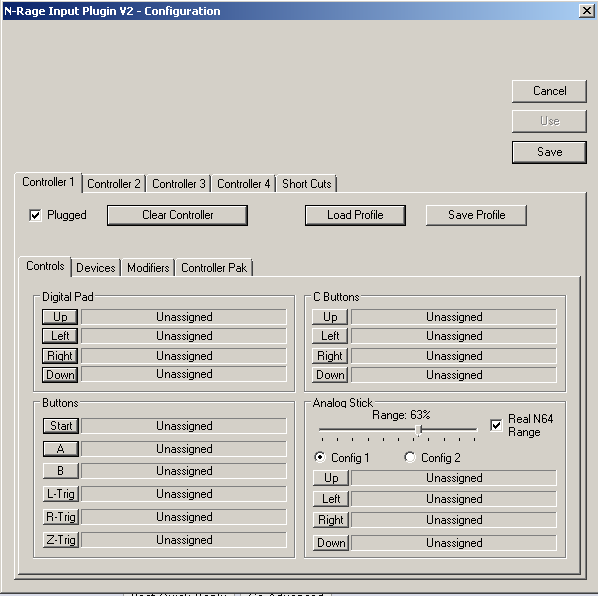 That looks like an old version of the plugin, make sure you are using the newest one (I believe n-rage is 2.5.2) and the same plugin for both versions of pj64. How do I update the plug-in? Alright, thanks! But is there a way to update the plug-in without needing to download the newest version?